Learn letters and build words with these easy-to-connect Jumbo Alphabet Unifix Cubes. 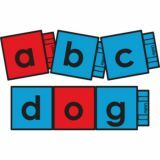 Young learners can sing the ABC song while pointing to each letter or create their name with the cubes. Includes 26 alphabet cubes (red vowels and blue consonants) and 4 blank cubes. With magnets over 2" square, this set includes 90 color-coded consonant and vowel cubes and 10 blank cubes. 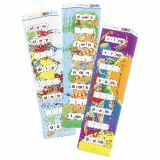 These large magnets can be seen from the back of the classroom. 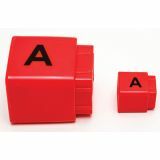 Use our blend cubes together with CVC or alphabet sets to create thousands of sounds and words. This set of 90 cubes includes the most frequently used two-letter initial blends, medial blends, digraphs and diphthongs. The initial blends and digraphs are green, the medial vowels are orange, and the ending blends and digraphs are yellow. Sets include an equal amount of each color. 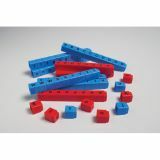 Designed for use by 4 to 6 students, includes 90 CVC Letter Cubes. 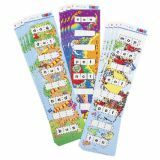 Build foundational reading skills with this multi-sensory phonemic awareness kit. 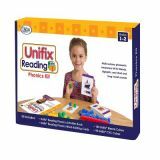 Using Unifix CVC cubes, kit includes activity book and cards to provide targeted practice for alphabet and early phonics concepts. 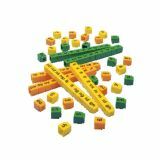 Set includes 90 CVC cubes as well as Early Phonics Activities book and Early Phonics Word Building Cards. Ideal for small-group or station work. Includes enough materials for 2–3 students. 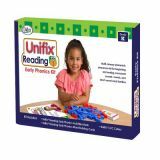 Give early readers hands-on foundational skills practice with this set of Unfix CVC and Blends letter cubes along with a comprehensive activity book and card set. 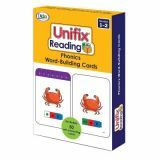 book and Phonics Word Building Cards. Ideal for small-group or station work. Includes enough materials for 2–3 students. Using these cards as a guide, students build words with Unifix Letter Cubes. Beginning and ending sounds and short vowel (CVC) word families. Each set includes 50 two-sided, illustrated cards. Blends and digraphs, short vowels, silent pattern and common vowel teams. Designed for use with Unifix Letter Cubes, each word ladder requires children to complete a series of words by changing one sound at each step down. Teaching notes and answers are included. 31⁄2" x 16". Set of 12.